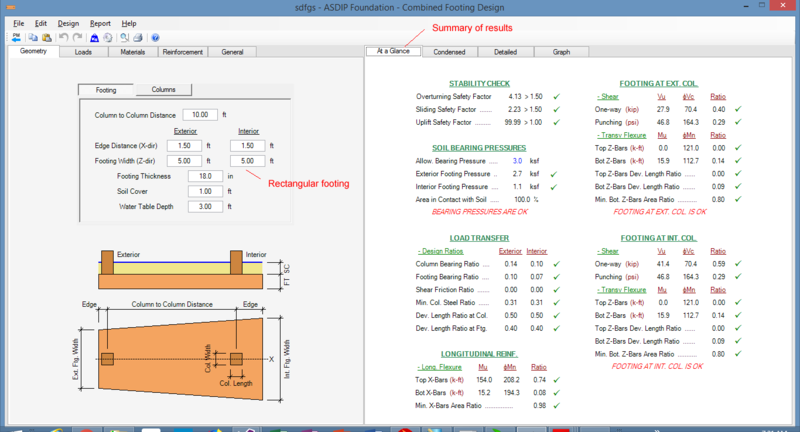 ASDIP FOUNDATION is a structural engineering software for the design of concrete footings. It includes the design of combined footings, based on the ACI 318 provisions. 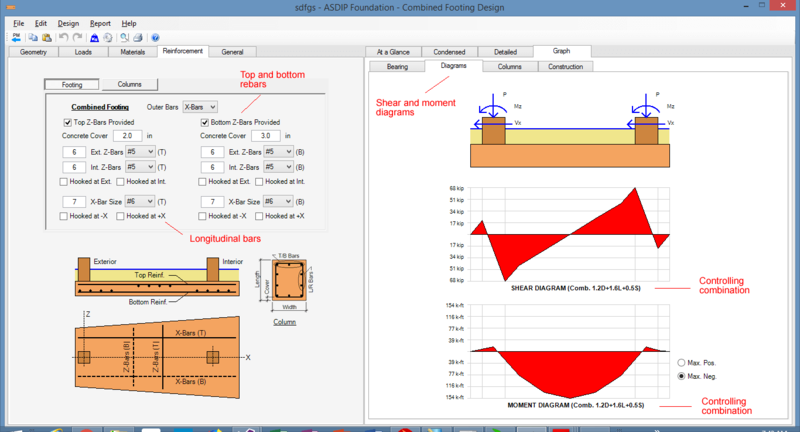 This document is a step-by-step design example of a real-life combined footing using ASDIP FOUNDATION software. As an example, consider the combined footing shown below, which is part of the foundation of a pipe rack in an industrial plant. A typical bent consists of two steel columns closely spaced that share the same footing. 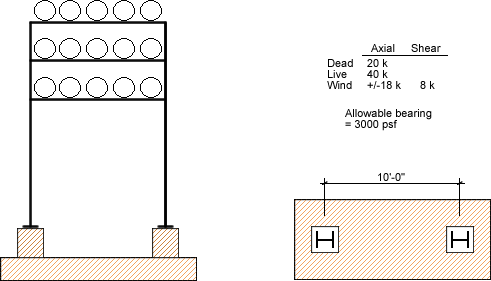 The pipe rack is exposed to dead, live, and wind loads, whose reactions are shown below. Design the footing size, thickness and reinforcement. 1.- Enter the geometric dimensions of the footing. In this case, the distance between columns is 10'-0". Let's try an edge distance of 1'-6", so the total footing length is 13'-0". Since the wind load could be reversed, the footing should be rectangular, not trapezoidal. Let's try a 5'-0" wide footing. The At-a-Glance tab shows a summary of the design for a quick overview of your work as you go. The green check marks indicate that all checks passed. 2.- Enter the pedestal dimensions and height. Note that the loads are applied at the top of pedestal, therefore the shear load will produce an overturning moment on the footing. This is the typical condition of footings in industrial plants, where the pedestal protects the column from corrosion. The Condensed tab shows a more complete set of results grouped by topic, great for a more detailed overview of your design. 3.- Enter the loads on the combined footing. In this example the analysis of the structure provided the reactions per load case, as shown in the statement above. 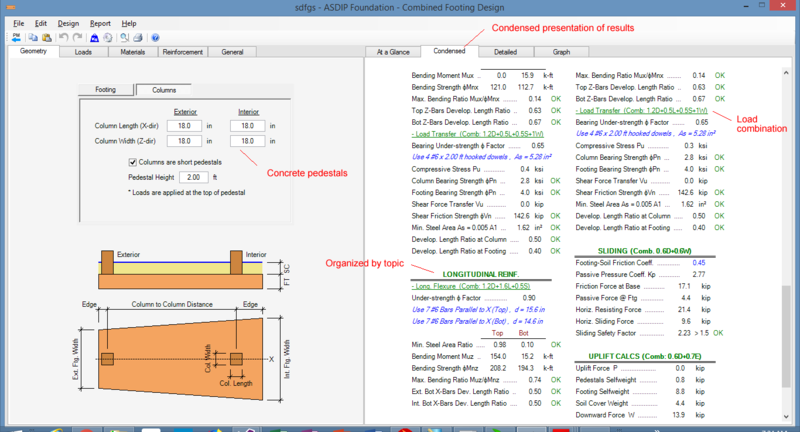 The base plates bear on top of the pedestals, and the columns have been modeled as pinned, so no moments in the reactions..The Detailed tab shows a complete set of calculations with exposed formulas and with references to the ACI code. An excellent tool for granular checking. 4.- Enter the material properties, such as the concrete and reinforcing steel strengths, the allowable soil bearing pressure, and the densities of concrete and soil cover. 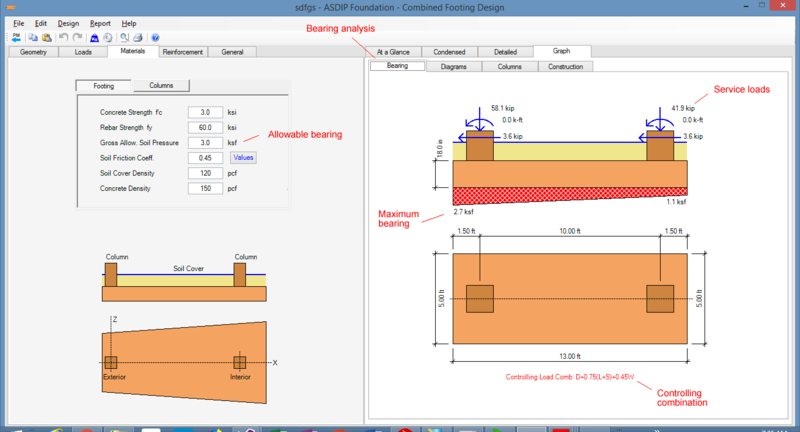 Verify the bearing results graphically. In this case the maximum bearing is below the allowable value. Note that the service loads have been used in the bearing analysis, and the program shows the controlling service load combination. 5.- Enter the reinforcement information for the footing. Specify the concrete cover and the bar number and size. In this example we will use #6 longitudinal bars top and bottom. This will provide the bending capacity of the combined footing acting as a beam. In the transverse direction let's specify #5 bars for the footing acting as a cantilever. 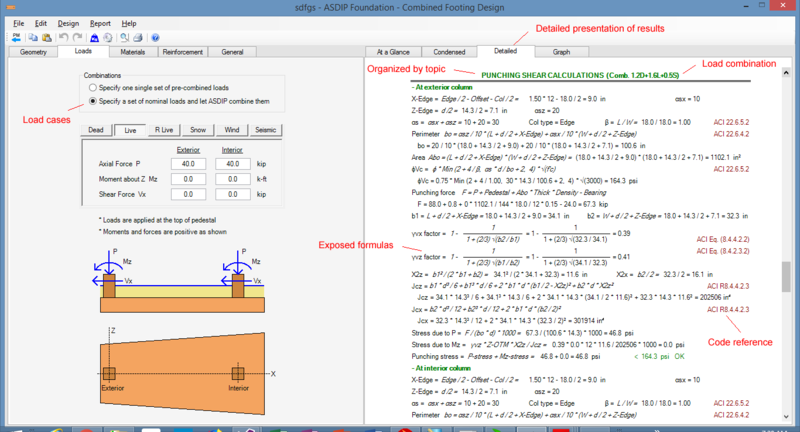 The Diagrams tab shows the shear and moment diagrams of the combined footing for the controlling factored load combinations. 6.- Enter the reinforcement information for the pedestals. ASDIP FOUNDATION will generate the interaction diagrams of the pedestals, and will compare this capacity versus the applied loads. The Construction tab shows the design sketches with the footing dimensions and reinforcement, similar to the construction drawings. 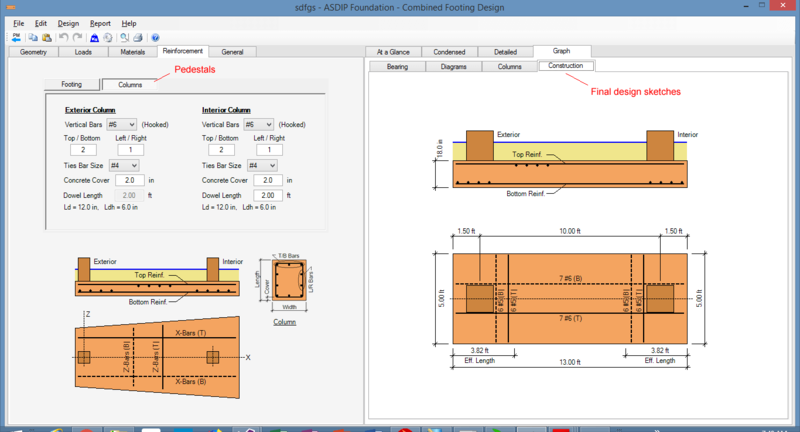 ASDIP FOUNDATION includes the design of combined footings, with multiple options to optimize the design easily. The design of combined footings may be cumbersome and error-prone. This real-life example shows that the design can be completed and optimized within minutes. For engineering background, please read my blog post Combined Footing: An Important Structural Design Element. Is the ratio column to column / footing thickness limited to a value in your software? I am asking because in the design of combined footings, the assumption of linear distribution of soil reaction is based on a stiff, not flexible footing. Otherwise the shape of the soil reaction does not remain linear. For instance, in Eurocodes, the distance between columns cannot exceed four times the footing thickness. Otherwise you have to design it as a raft. Can you clarify this point in your software? Thank you for your comment. The software assumes a stiff footing and a linear soil bearing pressure. I will incorporate a stiffness check in the software as you have suggested, per the beam on elastic foundation theory.